If you’re a regular here, you might have noticed that I sometimes take part in Kate’s Listography over at Kate Takes 5. You’ve probably also noticed that I’m annoyingly sentimental. But I don’t think I’ve mentioned that I hoard and retain and find it really hard to throw stuff away. Put those three things together, and this week’s Listography – five favourite mugs – was a dream come true. (I’m a bit late with this because I swear that somewhere there’s a film-tie-in mug that I bought after seeing Annie. Can’t find it, though. I’m suspecting my naughty little sister’s snaffled it). 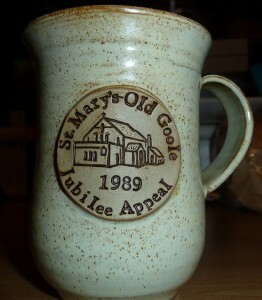 Growing up in Goole was a sort of messy jumble of damp grass and wild adventure. And the exoticness that comes with having a town of two halves, separated by a working shipyard and a series of lock gates. My friend lived in the other bit – the bit that involved risking possible death by drowning, or at least a stern telling off for those who were caught walking over bridges they shouldn’t be on. But she was worth the effort, I suppose. Her Mum was a bit of a leading light in the Church there, and we were occasionally invited to provide entertainments in the hall with our troop of performing children. I think most people came for the cake raffle, really, but they were always very encouraging of our efforts in the way that Churchy people often are. 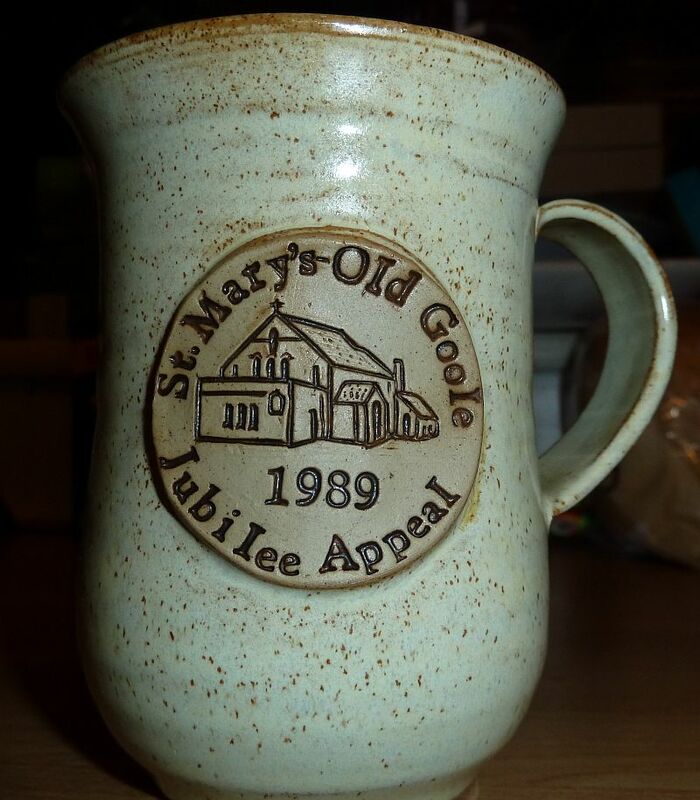 This is everything a mug should be; clearly commemorative, olde-worldy classy and dated to remind me that, at the age of 17, I was hanging around Church jubilee celebrations when I ought to have been out dancing. My Aunty Margaret had moved from Goole to Sheffield in her early twenties, but was home once a fortnight to share tales of life in the city. She would often talk about Sheffield Rag Week – the time when the students took almost everywhere over with their fundraising efforts and their excuses to dress up and entertain the locals. 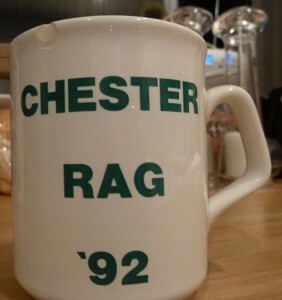 So when I went away to Chester, I threw myself into the Rag Week thing there. It was only later that someone told me that Rag’s for the geeky kids. But it was fun, anyway. The mug’s just a sort of ‘does what it says’ and cheap as chips option. And it’s actually chipped as chips too, which really means I ought to be keeping paint brushes in it or something. I don’t. 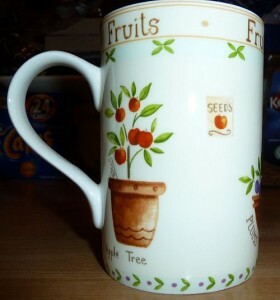 I keep it at the back of the cupboard and look at it wistfully every now and then when I think of my youth. I stayed up through three days and nights on the trot during Rag Week and still had the energy to laugh along with being thrown in the college pond on Friday afternoon. Oh, to have that energy again. This one here – the Boss one – is my work one, obviously (I mean, you’d never get Mike admitting that I was Boss in the house!). This was given to me by my PA at the time, somewhere around five years ago. 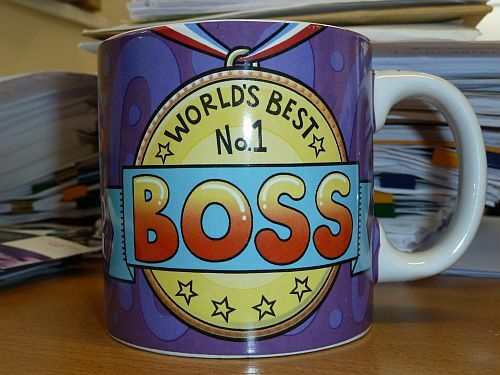 She was efficient and time-saving and knew that a gigantic mug meant that I wouldn’t be distracted by thirst when she was supplying me with chocolate biscuits. We had a rule that anything without a label on could only be counted as zero calorie, and that it would be impossible to try and guess its proper value. We both ballooned during that stretch of time. No idea why. I’ve positioned it here in front of my work and someone else’s to make me look horrifically busy. You should see how I’ve blazed through those piles this week (and broken my apostrophe key in the process, as per my previous blog post). There’s a rumour that it was given ironically, and that I’m not actually the Best Boss at all. I think that one was started by Mrs Button, whereupon someone went out and bought her a coaster bearing a similar legend. This is a little pause for an ‘ahhh’. 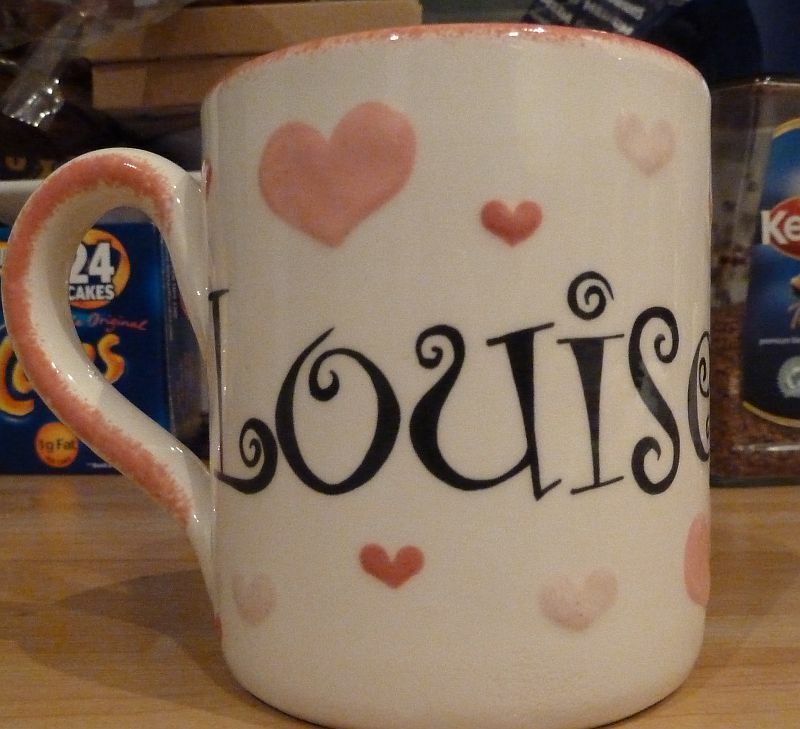 Bought when we were first together, in those first flushes where everything’s just brimming with lovlieness and it’s as if no-one else ever thought of having a pink hearty mug with their name on. I know I’ve said this before, but I never expected that I’d be loved like this. And I never expected that I’d tolerate anyone who messes up the kitchen as much as Mike does (although at least he shared the Jaffa Cakes). And this is the latest one in my collection. Mike’s Mum normally gives us tokens or money at Christmas, but she likes to make sure that everyone has something to open too. She has a real knack of choosing things that I’d never have chosen myself but I manage to fall in love with. Like this mug – a delicate little mug for a delicate sort of lady, which I’m not at all. But I really genuinely like this one. It makes me feel dainty and pretty. 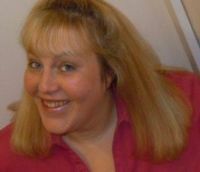 The year before, she bought me an amarylis growing kit, which was so amazing that even I couldn’t manage to kill it off. It even managed to produce a flower. Great Memories, In the first one I lament the fact that the kids of today aren’t permitted the risks we thought of as what made life real! That just goes to show that hoarding does have a place and time! lol I do the same, although I have been decluttering lately and have actually gotten rid of some stuff. I love all your mugs, and I wouldn’t get rid of any of them either!